Since PiobMaster 2.3 was launched, Ceol Mor Software & Publishing Ltd have listened to requests and suggestions from our customers located across the globe, on how we could improve PiobMaster 2.3. PiobMasterPro has been designed from scratch. As well as including all the standard PiobMaster 2.3 functionality, PiobMasterPro has been updated with a modern MS Office 2010 look & feel. 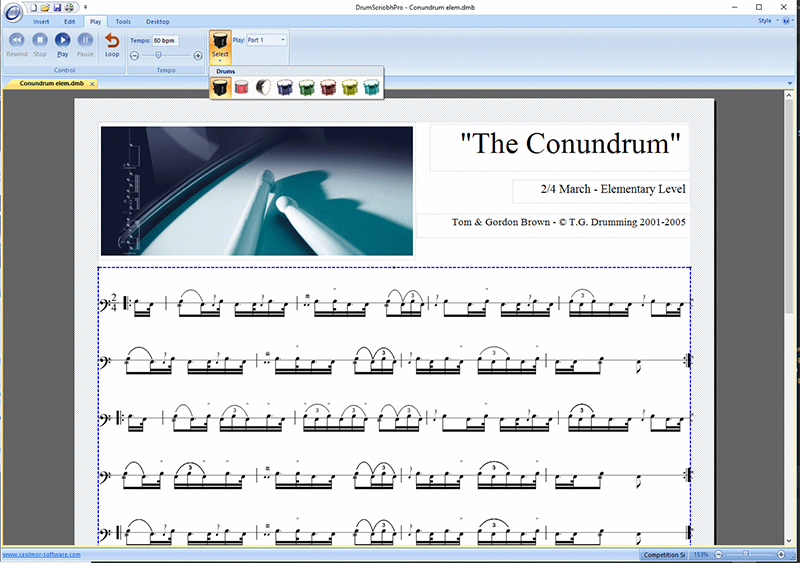 It is as much a music book publishing piece of software, as it is a pipe music writing program. This means that music tutor books can be reproduced where every phrase or exercise on the page comes to life with the ability for them to be played back. Checkout the example page from the National Piping Centre Tutorbook opposite. Complete flexibility regarding how the page can be constructed, including text, music and image objects has been designed into PiobMasterPro. Each object is effectively drawn onto the page, from which it can be resized and repositions anywhere on the page if required. 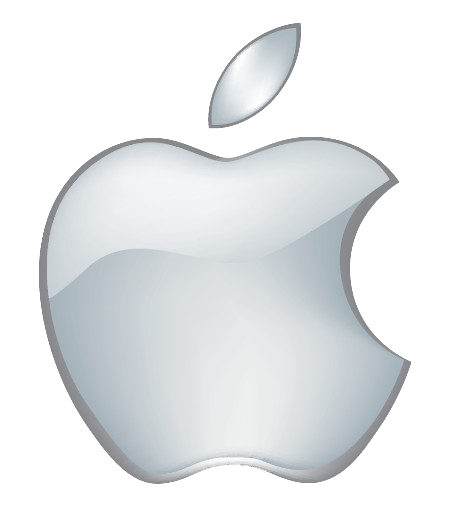 The contents of the object is also resized automaically. 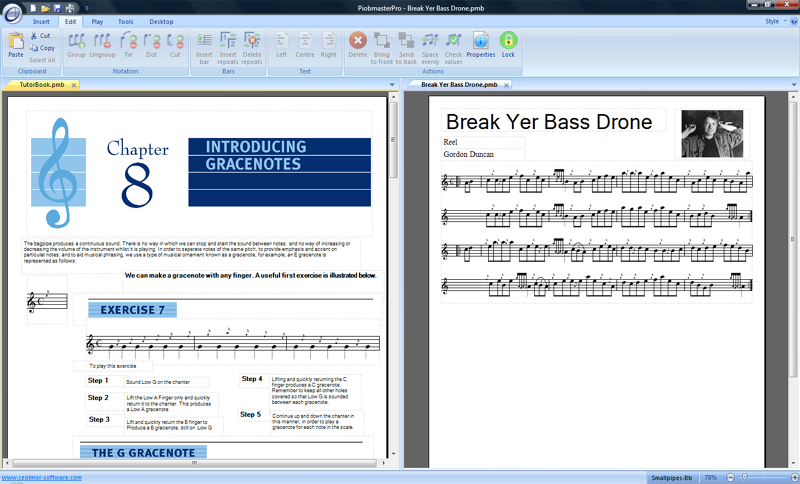 There is no limit to the number of Text, Music or Image objects that can be added to a document page. 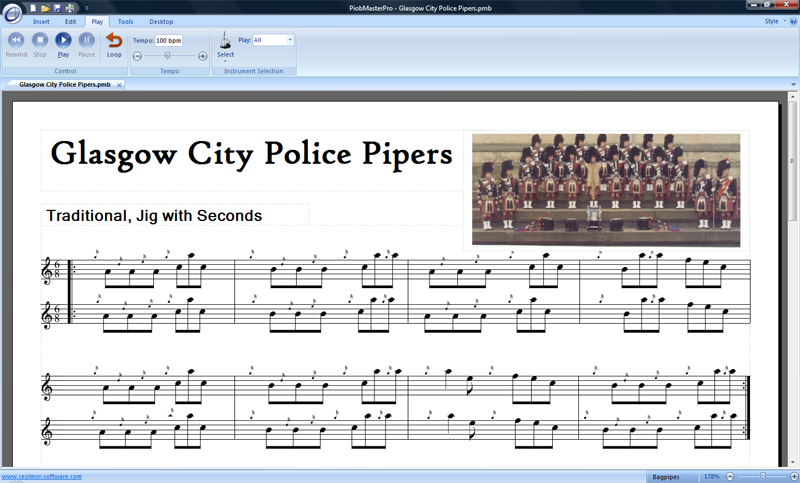 PiobMasterPro tabbed layout takes the user intuitively through the creation of a pipe music document. Multiple documents can be worked on simultaneously as they are also tabbed. PiobMasterPro supports 32 & 64 bit Vista and Win 7 operating systems. Powerful Copy & Paste functionality means that not only notes phrases can be copied and pasted, but whole Text, Music and Image objects can copied and pasted within the same tune, and other tunes being simultaneously worked on. 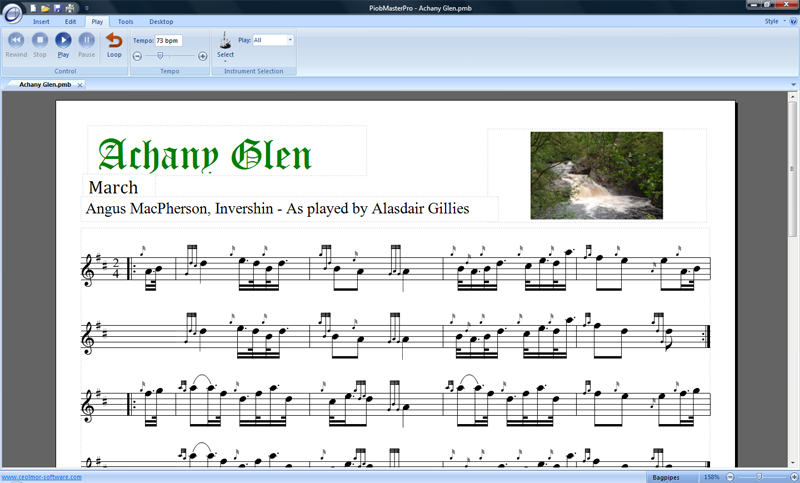 We have also included new pipe samples from world champion solo piper Angus MacColl, and small pipe samples from Kinnear Smallpipes in the key of Bb, A, C and D.
PiobMasterPro CDROM: Requires Internet access to install and register the product. 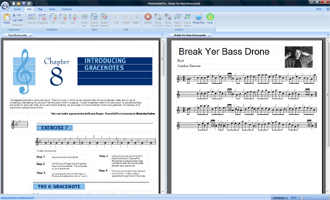 Desktop publishing capability including multiple tunes, text and images on page. 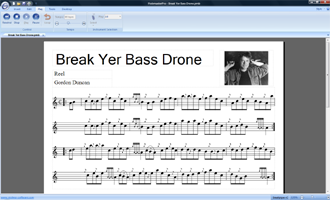 Sound playback using real bagpipe samples from World Champion Piper Angus MacColl. Improved sound playback functionality. Select a phase within the tune to be played or start playback from any part of the tune. User defined playback "weighting" adjustment on all notes, note groups, doublings, embellishments and movements. Right Click properties menu option.